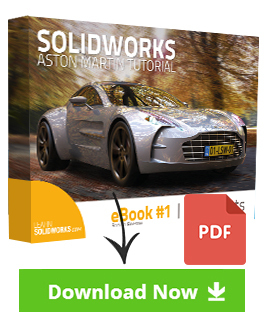 How To Save a SolidWorks File As 3D PDF? Sometimes I want to show my 3D models to someone who doesn’t have SolidWorks installed on his/her computer. 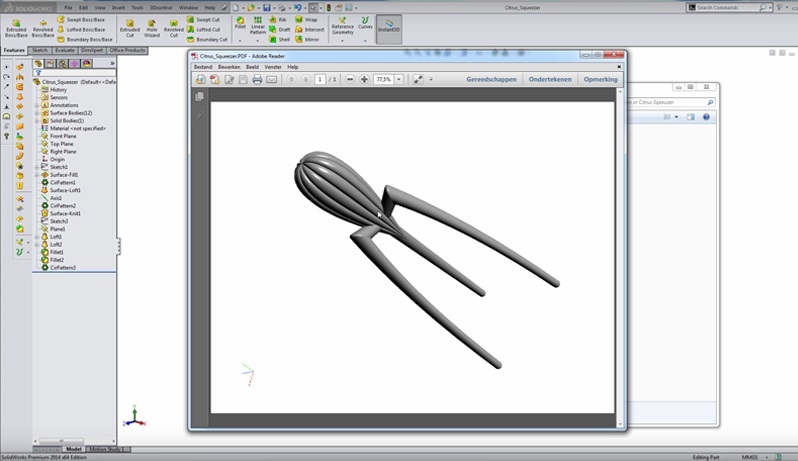 One option is to install eDrawings on your computer but luckily there is a quicker and much easier way to show someone a quick preview of your SolidWorks model in 3D. Because you can also save your SolidWorks file as a 3D PDF. 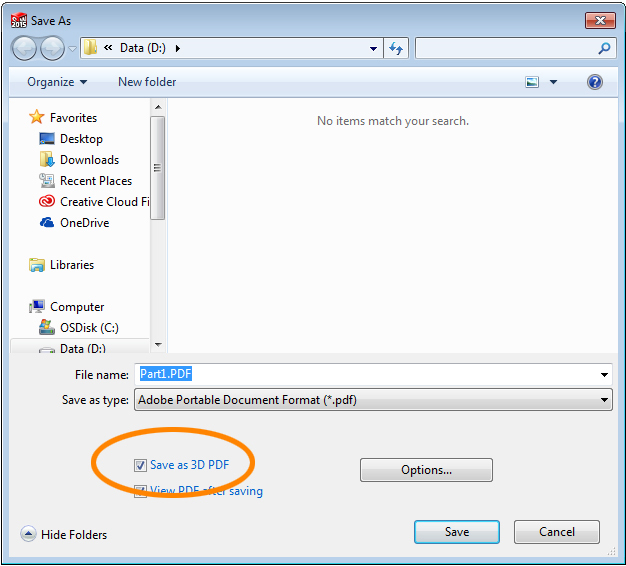 Go to File > Save As > Save as type and change the default Part extension into Adobe Portable Format (PDF). Now select the “Save as 3D PDF” option. 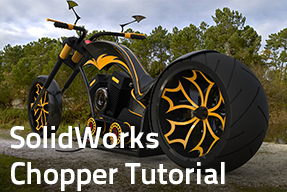 Do you like my SolidWorks tips and do you want to receive a free SolidWorks eBooks series in your mailbox? 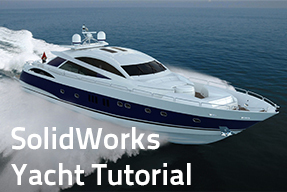 Then you should check my SolidWorks Yacht tutorial. 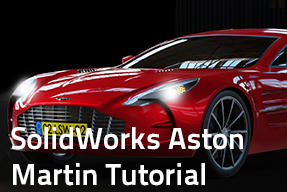 In this tutorial you will discover how to model an amazing yacht in SolidWorks. Previous post How To Increase The Image Quality In SolidWorks? Next post How To Add And Modify Perspective In SolidWorks? Great topic, Jan! More folks should know about this one. One other excellent benefit of using Adobe 3D PDF’s to share and express designs is the reduced computing power needed to accomplish useful interaction. Without upgrading our shop manager’s PC hardware which was far less capable than the designers’ workstation PCs, viewing large assemblies in eDrawings was very slow to load, and frustratingly chunky when interacting by rotate, zoom, select, measure, etc. On the other hand, 3D PDF performs much better even on PCs with minimal system specs. In 3D PDF, you have access to the same or similar view, section, and measure functions. Any view can be saved and labelled for later retrieval too. This alone saved is a video card and RAM upgrade (and a lot of frustration) for a user PC that otherwise views websites, spreadsheets, normal PDFs, and email. It is very interoperable and easy! So, in the scheme of things, not such a storage demand to worry about. Also, it’s within normal range of ability to email to others (20 – 25 Mb attachment limit varies). * It does lack the complete detailed interactivity with every component like extracting custom properties or Isolate, but viewers shouldn’t need all that anyway. * The Model Tree doesn’t show folders from the Design Tree, and seems to have very little order to it compared to the Assembly. It includes name of the Configuration but lacks other configurations.